To apply for Signature EC Yishun, you need to submit copies of supporting documents. These are listed below. HDB may also require you to provide additional documents subsequently. If you’d like a shortcut instead of reading it, just call us at (+65) 9633 8633, or email us below. We’ll tell you the documents specific to your situation. In probably 5 minutes flat. Main applicant for Signature EC Yishun must be a Singapore citizen. Family nucleus must include at least one other Singapore citizen, or a Singapore Permanent Resident. Average gross monthly household income should not exceed $14,000. If it exceeds $14,000, call or contact us for assistance to apply for Signature EC Yishun, assessable on a case by case basis. Part-time Worker Assessed based on average monthly gross income for past 12 months. Excludes income from overtime work, but includes allowances (fixed/variable) received on a regular basis (e.g. transport, phone, food, uniform, etc). Self-Employed Person Assessed based on average monthly gross income for previous 12 months. Odd Job Worker Assessed based on average monthly gross income for past 12 months. *Applicable to applicants and all occupiers between 18 to 62 years old who are unemployed. If the applicants and/or occupiers are unemployed for fewer than 3 months, the average income will be computed based on number of actual months he/she has worked. The Statutory Declaration may be executed at HDB Hub Sales Office, or at any HDB Branch Office. If you are not in Singapore, you can make the Statutory Declaration in the presence of a Commissioner for Oaths or Notary Public in the country where you stay. The Statutory Declaration should only be done when you buy a unit, so do it after booking your Signature EC Yishun unit, preferably on the same day. If you would like help to assess your eligibility to buy a unit at Signature EC Yishun, or the documents required, or to be kept updated / register for showflat viewing, please email us here. This entry was posted in Signature at Yishun on June 21, 2015 by soohoon. The CPF Housing Grant is a housing subsidy (as CPF funds) provided by the Government. This grant assists eligible 1st-timers to buy a new EC, eg. at the Signature at Yishun EC. Overwhelmed or confused by all the conditions? No worries – just call us at (+65) 9633 8633, or email us below, and we’ll simplify it for your specific situation. Can the Grant be Deferred? EC Buyer with Average Gross Monthly Household Income up to $10,000. #If you are a Singapore Citizen (SC) married to a Singapore Permanent Resident (SPR) (that is, an SC/SPR household), you can apply for the Citizen Top-Up Grant when your SPR family member gets Singapore Citizenship or when you have an SC child. #If you are from an SC/SPR household, you can apply for the Citizen Top-Up when your SPR family member takes up Singapore Citizenship or when you have an SC child. Read more on the Citizen Top-up (opens in new window). Buyers with Average Gross Monthly Household Income above $12,000. If your monthly household income is above $12,000, then the CPF Housing Grant does not apply. Citizenship You must be a Singapore Citizen. Your family nucleus must comprise at least another Singapore Permanent Resident or Singapore Citizen. You may apply for the CPF Housing Grant when you book a unit with the developer. You will be provided the form to apply for the grant, and the developer will submit this form with the rest of your application for the Signature at Yishun EC. Can 1st Timer Buyers ‘keep’ the CPF Housing Grant for purchase of the next BTO or EC instead? No. The CPF Housing Grant cannot be kept for the next BTO / EC purchase. If you don’t use it for your first EC purchase, you will forfeit it. Furthermore, even if you don’t take the grant this time, you will still be subject to the resale levy if you buy a BTO HDB flat or another new EC in future. So if you are eligible, it makes good sense to take the CPF Housing Grant now. All the more since, as you advance in your career, your income is likely to increase, which could make you exceed the income ceiling for purchase of an EC in future. The Grant is given only to the Singapore Citizen (not the SPR spouse). Joint Applicants (husband & wife) Half of the full grant each. (e.g. married siblings, parents & married child) Grant given only to one eligible applicant per flat. The Top-Up Grant is given only to the Singapore Citizen spouse (not the Singapore Permanent Resident spouse) who is listed as an owner or applicant of the Signature at Yishun EC. The CPF Housing Grant will be credited to your CPF Ordinary Account & treated as part of your CPF fund. It can be used to pay for the 2nd part of the downpayment for the Signature at Yishun EC at the time of signing of the Sales & Purchase Agreement, after you have paid the cash payment (if applicable), or to reduce the mortgage loan. The CPF Housing Grant will be included in the computation of the CPF withdrawal limit for your Signature at Yishun EC purchase. If you would like help on assessing your CPF Housing Grant Eligibility for the Signature at Yishun EC, or to register for showflat viewing or e-application or the CPF Grant itself, please email here. Yishun, which has more than 250,000 residents, is no longer a boring ‘Ulu’ backwater. In fact, it is actually enjoying a revival of sorts. 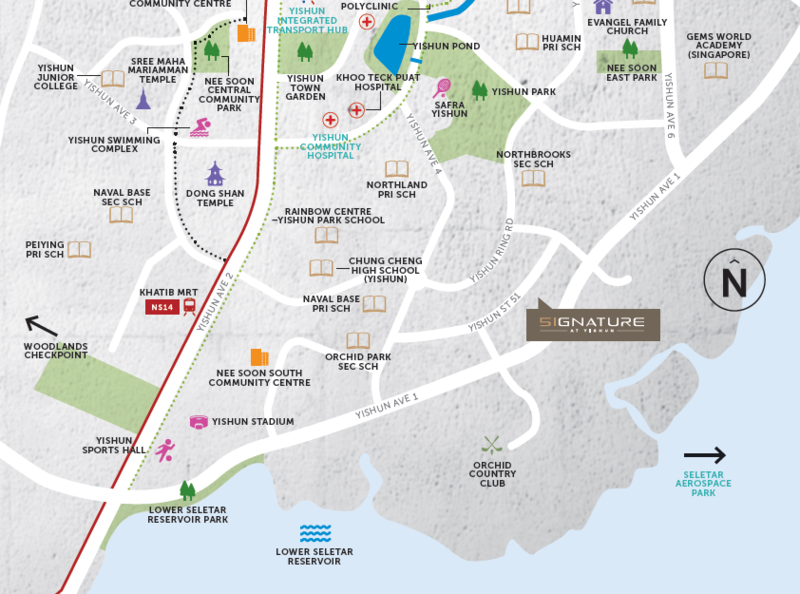 New amenities, a mega mall, brand new healthcare centres, new residential projects, and a regional growth area (Seletar Regional Centre) with its promise of 10,000 new jobs and ensuing expat flow, are all in the works. The mega mall 2km from the Signature EC at Yishun, is North Point City, a commercial and residential project that will be integrated with the existing Northpoint Shopping Centre. Targeted to open in 2018, it will be the biggest mall in the north, with over 500 F&B, shopping and banking outlets. It will also house a community club, and be linked to an air-conditioned bus interchange and Yishun MRT station. So strong is the draw of this development, that it sold over 50% of its private condo units at North Park Residences sitting atop North Point, within 2 weeks of its launch in April this year, at an average of $1,350 PSF. Junction Nine in Yishun Avenue 9, a 99-year leasehold mixed development with retail units, will also open in 2017. Residents at the Signature EC at Yishun will be spoilt for shopping choices. The greenery in the area – Seletar Reservoir, Yishun Pond, and the Orchid Country Club with its golf course – are also what draws buyers looking for a more tranquil lifestyle. Like other well-developed residential estates, Yishun has several recreational options, cycling paths and fitness & exercise corners. In addition, it has scenic waterways & serene green parks. 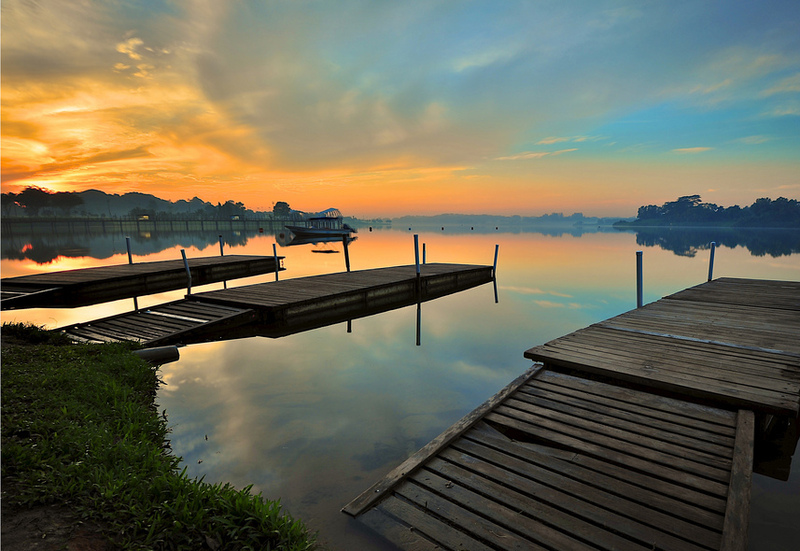 The Lower Seletar Reservoir was redeveloped at a cost of $10 million. It now has a multi-purpose stage, water play area, a 170m-long jetty-like bridge that extends across the waters of the reservoir, and a Rowers’ Bay for competitive rowing. In a 2011 revamp, Yishun Pond unveiled floating wetlands, a three-storey lookout tower, and flower trails. A new leisure park the size of 7 football fields, Orto, has opened recently, that has some of the old kampung charm of Singapore of the 1960s & 70s. Visitors can go prawning or fishing there, and it also has several eateries. For the young, and young-at-heart, it offers more strenuous activities like paintball, futsal and trampoline. A 15.5km cycling trail, due to complete end 2015, will connect major transport nodes, neighbourhood centres and parks. Just register here if you would like to be kept updated, or to register interest in the Signature EC at Yishun. This entry was posted in Signature at Yishun on June 20, 2015 by soohoon.